In Papua you can still find absolutely primitive cultures whose development ended in the Neolithic period (younger Stone Age). Most of these tribes live in the western part of the island, but surprisingly, new ones can be found in the most inaccessible parts of Papua New Guinea. Even the most detailed pilot maps of the island contain white places, which bear the following text: „Relief data incomplete“ or „We believed not exceed 5300 ft“. Are there any undiscovered tribes in Papua? Is it possible to find people who have never seen a white man? It´s the third millenium! These were the questions we were asking before our expedition, discussing, confirming and disconfirming. We planned to visit several areas in PNG, selecting one by one. Finally we chose Upper Sepik which looked to be the best accessible destination. We didn´t have much money and other localities, although more promising, were too expensive. Nevertheless, we were surprised by what we found! Well – have a look at the snaps! And still there are other, more promising localities for the next time!!! 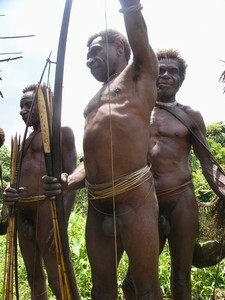 People of Upper Sepik usually wear nothing, men are naked, women use short skirts. These skirts are swinged during dances while men use their penises as drum sticks. When we saw that for the first time we were completely astonished. So bare and simple. And we could understand from that moment why they use so strange kotekas which are laden with resin to be heavier. One more surprise prepared by Papua. When is our next „First Contact“ Expedition going to be organized? Hard to say. Maybe in 2016, or in 2017 or even later??? Well, it is up to our financial sources… If we could decide, we would go at once! People have been changing – civilization comes everywhere. People are oppressed by the government, churches, timber producing companies… Missionaires have been everywhere! Yes, even in the area we visited this time. Some people have been dressed and those still naked are under a big pressure to get dressed, too. The time is implacable. When people ask me about the best time to go to Papua I usually tell them the best time was yesterday, or the day before… All we can do now is to hope that our next expedition is not the last one. Cross your fingers – for us and especially for the Papuans to wish them living in their natural way of life as long as possible..
We have tried to reach the territory of this tribe already in 2004. Unfortunately at that time we didn’t succeed. We were not ready to carry all our equipment by ourselves and no native was willing to go with us to the area where the tribe Korowai Dalam lives. „They would kill us and eat us!“ it was told to us by Korowai Batu in all the villages where we tried to persuade people to guide us on our trip to this fabulous tribe. 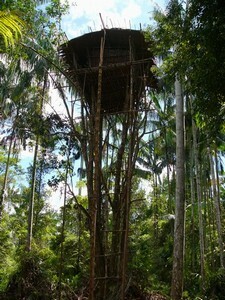 The Kombai and Korowai, other Tree people tribes living in the area, had no idea that the Korowai Dalam existed. In November 2009 we made another expedition to the tribe Korowai Dalam though. Only the best could join the team.The most experienced people who where willing to bear the risk of possible failure and eventual injury. None of us knew for sure that the Korowai Dalam existed and we did not know whether they would react aggressively. The Expedition Korowai Dalam 2009 exceeded all our expectations as well as our most secret and boldest dreams. Yes, there were some villages where the people did not let us go in and we had to walk around them at a safe distance. But the places where we were able to come along with the inhabitants were fascinating. I have visited Papua 12 years already, but I have never experienced such a great expedition as before. Lots of tree houses are situated very high in the tree tops and decorated by the bones of hunted animals – like haunted castles. And the people? In the villages where the people let us go in we were able to make some friends. We could hunt with them, cook with them and join them at their meal. We could sleep in their houses and watch them make their stone axes and arrows from the cassowary bones, … I can say they accepted us as friends and invited us to come again. Therefore we’re going to organize more expeditions to the Korowai Dalam. These expeditions will be open to anyone who has got an experience with a trek in the jungle carrying a load, as it is possible that we have to carry all our equipment by ourselves again… Anyone who is interested can join us. Cave people were discovered very recently – in the beginning of February 2006. Petr Jahoda left for this expedition together with Australian-Austrian team in May 2006. With the use of helicopters, the expedition reached the place of the alleged dwellings of the Cave people. The initial information showed to be untrue. However, the expedition therefore set an alternative goal, Moii tribe. Missionaries came to this tribe and settled in its territory mere five years ago. Moii tribe is very isolated; it would be practically impossible to reach without the use of helicopters. The members of the Moii tribe, men and women, decorate their nasal partitions with casuar bones. Men wear kotekas and women only short skirts. Moii smoke unusual bamboo pipes. They are not approachable people. In addition, they are moody. Despite these obstacles, we managed to get on friendly terms with them at least for short periods of time. We enjoyed wonderful moments during the stay at this tribe. The most interesting finding was the culture of the Moii tribe. They protect their living environment as well as maintain excellent conditions for manufacturing and trading goods. So far, we have not seen anything like this at any „primitive“ tribe. This expedition brought many new pieces of knowledge and can be evaluated as highly successful. In 2005 I was lucky enough to find a tribe in the jungle that has not been recorded yet. Thus, it has not been officially discovered. I don’t claim that I am the first one to discover these people; I only assert that no one has ever published anything about them to date. I don’t include here any – even an approximation – as to the location of this “unnamed” tribe. I only decided to publish photos and possibly a description of their customs, similarly as I did with the Simba tribe. Let’s call this tribe “Unda” (like a unique tribe). Its tribesmen walk around completely naked, or they wear “egg” koteks, which I have not even heard of yet. The women also walked naked only two years ago, but because of contact with a neighboring tribe which was slowly starting to civilize, some women began to wear short skirts. It is one of the only two known Papuan tribes that are naked. So far this was only known about the Asmat tribe. Other new tribes can be still discovered in the basin of the Mamberamo River. It is difficult to say whether there are are any other tree people tribes behind the pacification line, as only few people manage to penetrate it. Until now, Papua has been the wildest area in the entire world. First contact expeditions head towards these “remote areas”. In 2004, I came to the Simba tribe which had been discovered only few years earlier – in 1999. I spent several wonderful weeks with people from this tribe. They live deep in the mountains. Nothing has ever been published about the Simba tribe, and I don’t want to publish anything in greater detail about it either.